It’s no major secret that I used to be pretty messy. It’s also not a secret that sometimes I’m still messy, because I’m a work in progress. I have, however, come a long way in the housekeeping department. As-in, we can have company over without me driving my family crazy while I frantically clean. And when I fall behind, I can catch back up in a relatively short amount of time. The Messies Manual was the first book that helped me unbury my own home from clutter. This interesting and funny read really digs into the heart of why we keep things, it talks about different types of messy people (I’m a perfectionist messy!) and, without being overwhelming, The Messies Manual thoroughly discusses how to declutter and organize the home. I never thought the state of my home had anything to do with Christianity – until I read 31 Days to Clean. While reading this book, I realized that drowning in clutter was having a negative effect on my spiritual life. In this very raw, convicting, and inspiring book, Sarah Mae didn’t stop at creating a vision for a clean home – each day’s reading is also packed with encouragement that includes a simple Mary (heart-related) challenge and a Martha (specific cleaning) task. 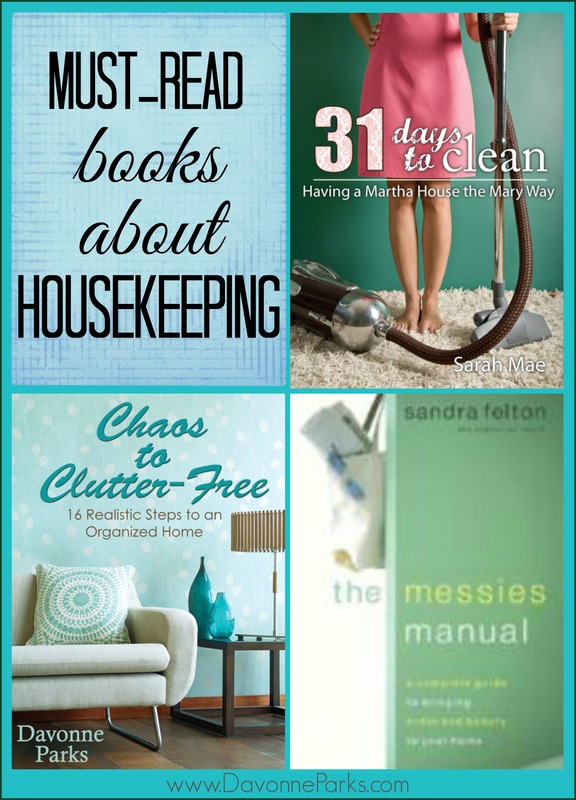 Why am I listing my own book as one of my favorite housekeeping reads? Because this book was my heart’s cry. I used to feel as if I were drowning in clutter and couldn’t find my way out. Our many possessions no longer felt like a blessing to my family, but a burden. I’d desperately think, There has to be a better way, but I felt unable to find that better way. So after I learned how to create – and maintain – an organized home, I wanted to help others find that freedom as well. From inspirational quotes, to tips and encouragement, to simple maintenance plans and embarrassing stories, Chaos to Clutter-Free is a simple and realistic guide for restoring (or finding) order in your home. For years I’ve used FlyLady.net. Marla’s baby steps finally got my home and my life in order! Like you mentioned, our clutter and messes are hurting our families. An orderly home is a blessing. Oh, Flylady – I used to read things on her site all the time for inspiration. I’m adding her to my best free resources for 2015 article, thank you for the wonderful reminder!